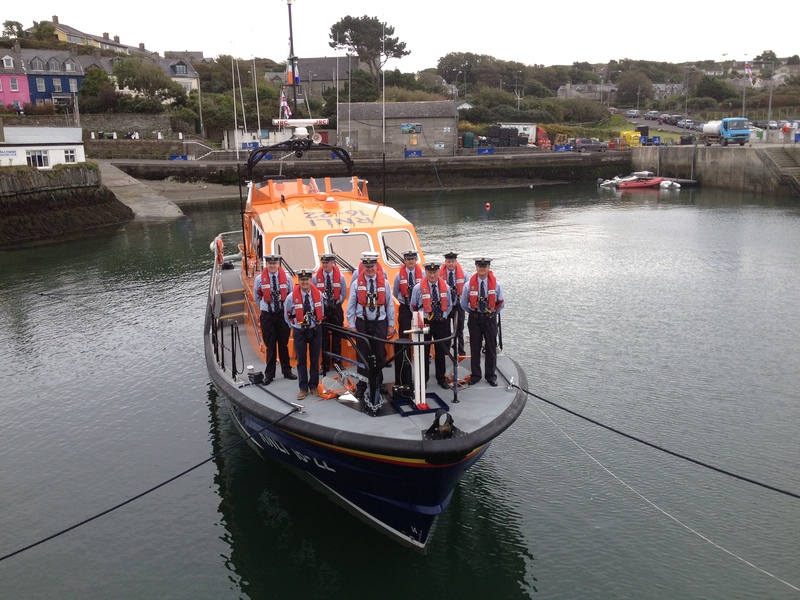 A new Tamar class RNLI lifeboat recently put on service at Baltimore in West Cork, was this weekend (Saturday 22 September 2012) officially named Alan Massey during a special ceremony. The lifeboat was substantially funded by a legacy from Ms Dorothy May Massey in honour of her late brother Alan. It was named by Mrs Sue Windsor, a close family friend of Ms Massey, before being handed over to Baltimore RNLI. Mr. Declan Tiernan, Chairperson of the Baltimore Lifeboat Station stated that the lifeboat has already proved its worth. He told the crowd about a recent callout which involved the new lifeboat and its Y boat (an inflatable boat carried on the deck of the lifeboat). Last month two teenagers were trapped in a cave and conditions were making it impossible for rescuers to get close, the lifeboat crew deployed the small Y boat from the lifeboat to bring the lifeboat volunteers as far into the narrow cave as they could safely go before a crewmember then swam the rest of the way and brought them to safety. RNLI Operations Director Michael Vlasto OBE, who travelled to Baltimore to accept the lifeboat into the care of the Institution commented, “ Baltimore’s lifeboats have a proud history of lifesaving dating back to 1919 and since then have launched 718 times and in so doing have rescued 661 people. Ten medals have been awarded, the last being voted in 1992 to the current Coxswain Kieran Cotter. Tom Bushe, Baltimore RNLI Lifeboat Operations Manager accepted the lifeboat into the care of the Baltimore Lifeboat station. The new lifeboat has already launched 14 times and rescued 17 people since its arrival in February. Tom added, “ We are very proud to be the custodians of this lifeboat. The crew in Baltimore provide an exceptional service to their community. These are ordinary people who are ready to risk their own lives in the service of others. The lifeboat was officially named in the traditional way of breaking a bottle of champagne over the bow. Mrs Sue Windsor then named the lifeboat Alan Massey. Ms Dorothy May Massey was born in 1906 and lived in Watford. She was the youngest of three children. It was her wish to fund a lifeboat and she passed away in 2003 aged 97. The Baltimore Tamar lifeboat has been substantially funded by her legacy together with the generous bequests of Henry and Joan Jermyn, John Noel Harvey Ward and John Heath. The new Tamar class lifeboat is 16.3 metres in length with a maximum speed of 25 knots compared to the 14.3 metres of Baltimore RNLI’s former Tyne class lifeboat, which had a maximum speed of 18 knots. The lifeboat is self-righting and is fitted with an integrated electronics systems and information management system, which allows the lifeboat crew to monitor, operate and control many of the boats systems from shock mitigating seats. It has room for 44 survivors. The event included local school children from Rath National School who sang the lifeboat anthem Home from the Sea and groups and musicians including the Rathmore Church Choir, The Baltimore Singers and HX Brass. Next Post: New Inshore Lifeboat arrives at Baltimore Lifeboat Station.